Scratch that title – it sounds like a thesis paper! LOL But ever since I started shaving (which as we all know, damages skin) a decade ago, I decided that i needed to maintain and take care my bodily skin, which is actually the largest organ, so I was quite familiar with a lot of body care products in the market. 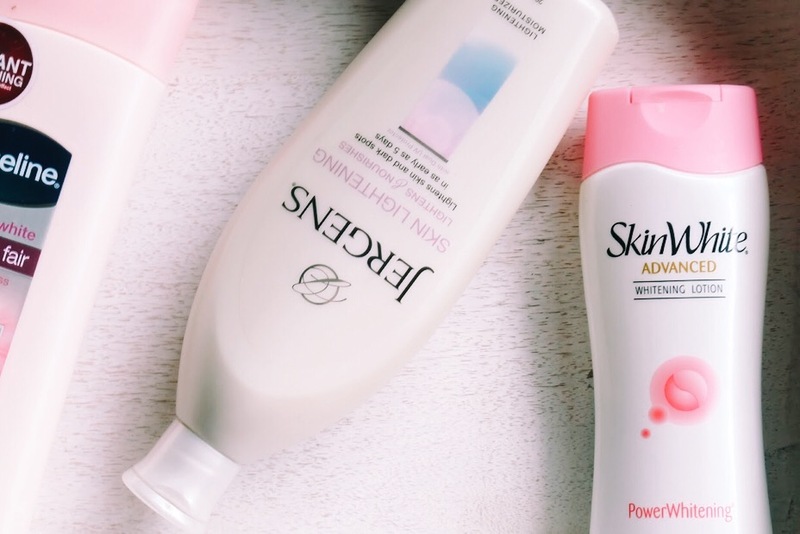 I selected Whitening Brightening options for this purpose because almost all of them have good and healthy ingredients that target uneven skin tone and spots (I don’t like to change the color of my skin though). And while some of these can do whitening really, I will be discussing more about their texture, feel, consistency, ingredients and targeted uses for me, which may help you achieve healthier and glowing skin which for me is more essential. Jergens Skin Lightening Lotion – Except that it doesn’t have SPF, the texture and feel are great. It is easy to spread and dries quickly too! The scent is not too much and the effect is refreshed and luminous especially with the new HYDRALUCENCE formula injected by Jergens. See arm swatch above. 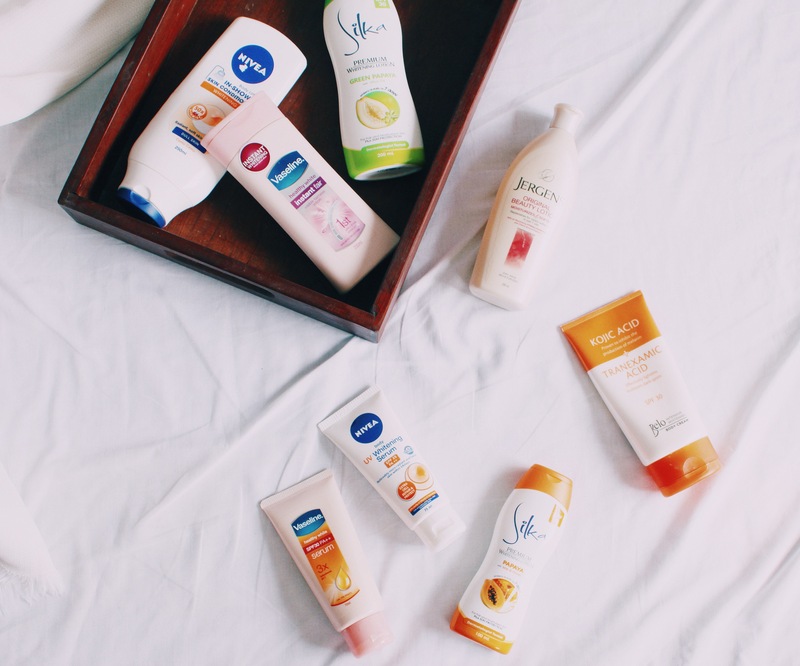 NIVEA Extra White Body Lotion – This has been a favorite for years. 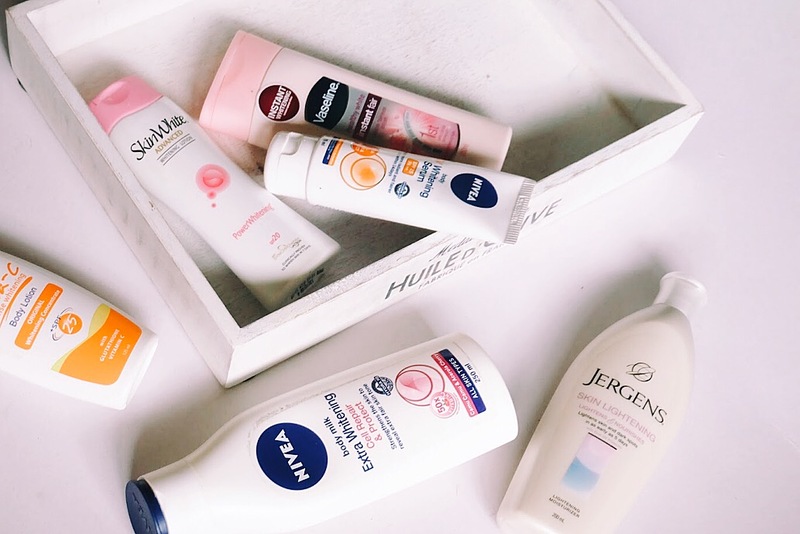 NIVEA creams and formulas (blue tin included), in general, just suit my skin and are my rescue products when I have bad skin days (impurities included like itchy skin). I just don’t have a swatch of this one as I switched to the Serum (you’ll know below), but especially because of own’s skin ingredient Q10 and innovative CamuCamu (90% more powerful than Vitamin C in lightening). NIVEA In-Shower Whitening Skin Conditioner – Since its launch locally in The Philippines – I have tried the fantastic product prior to this – I have loved how it preps my skin at shower which makes leave-on lotion application easier and deeper for my skin. Silka Premium Whitening Lotion SPF 30 – I am talking about the Green Papaya variant which just smells so good! It has papaya enzymes known to lighten and exfoliate skin, with one of my favorite ingredients: milk, honey and olive oil! I just don’t like how difficult it is to blend to the skin and how thick it is at first, but once it’s dried, I noticed that it has a locked-in moisture on the body which is very recommendable. This product type started 2 years ago with NIVEA and I really like using serums for the face. Why not for the body? 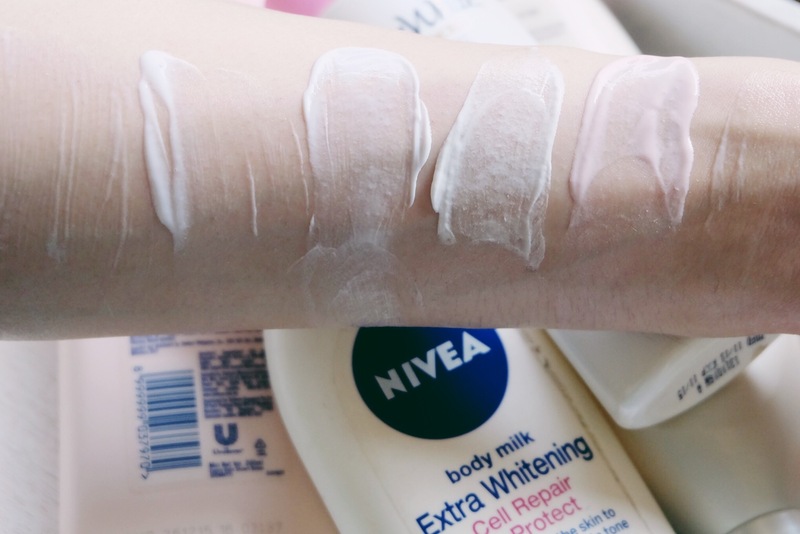 NIVEA UV Whitening Serum SPF 25 PA++ – Almost like water (see below swatch)! Despite how it is called a serum (with powerful ingredients and all for dull and damaged skin), this is the best formula for me because it blends well with the skin and dries quickly too. I use this at day, but more at night after shower so i can really repair the skin, especially because of patented moisturizing Hydra-IQ formula, 96% pure Vit. C derivatives, Licorice (a super nice natural whitening ingredient), Red Seaweed, giving a nice fruity-floral scent too. Vaseline Healthy White Serum SPF 30 PA++ – This product promises “extra protection to lighten skin evenly, even under the sun”. I see this product marketed just like a sunblock but I don’t see it like that really especially when going to the beach where I would recommend around SPF 45-50. 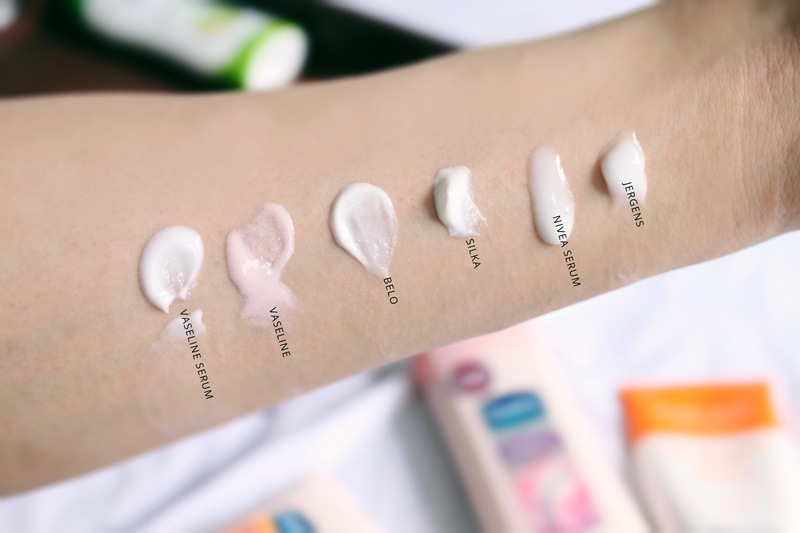 The SPF level is recommendable indeed for daily use (I recommend if you will have 4-5 hours of outdoor exposure) and the feel, texture and scent is lighter than a sunblock (+no white cast despite the sunscreen level which is the hightest in this list! ), with lightening property promised to be delivered by Vitamin B3. 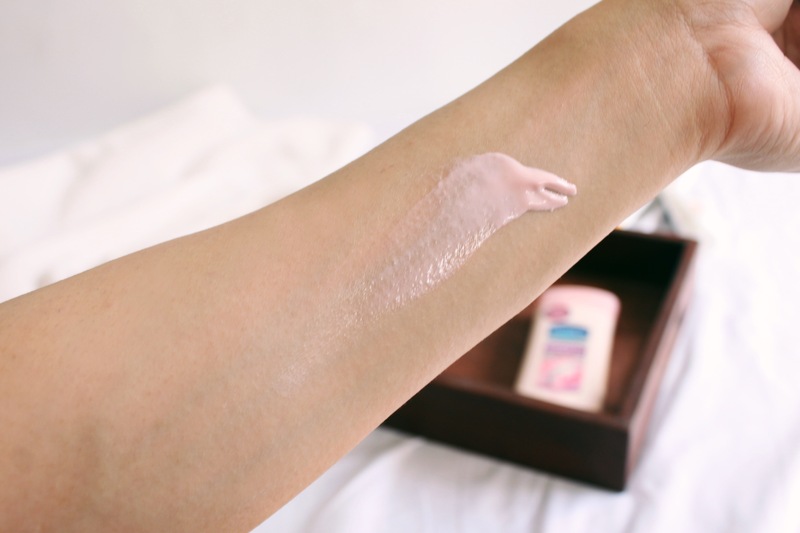 Vaseline Healthy White Instant Fair Lotion – I got so intrigued by this product and it indeed lightens on a cosmetic level (I can consider this like a makeup primer -well, i really put foundation/BB cream on my legs sometimes). See swatches below where skin appears brighter, more pink, and even under light. The main ingredients of this product are “Microreflectors” that allow for instant fairer skin, together with Vit B3 and sunscreens. This quickly dries too and isn’t hard to blend. No white cast as well! SkinWhite Advanced Power Whitening Lotion SPF 20 – I have tried this brand a long time ago and this slightly whitened my skin before, despite not liking its stickiness. Now, it promises to “fight Skin aging and achieve noticeably whiter skin instantly upon application.”It is said to use an exclusive Advanced Tripower Technology that “whitens instantly and whitens continuously”. 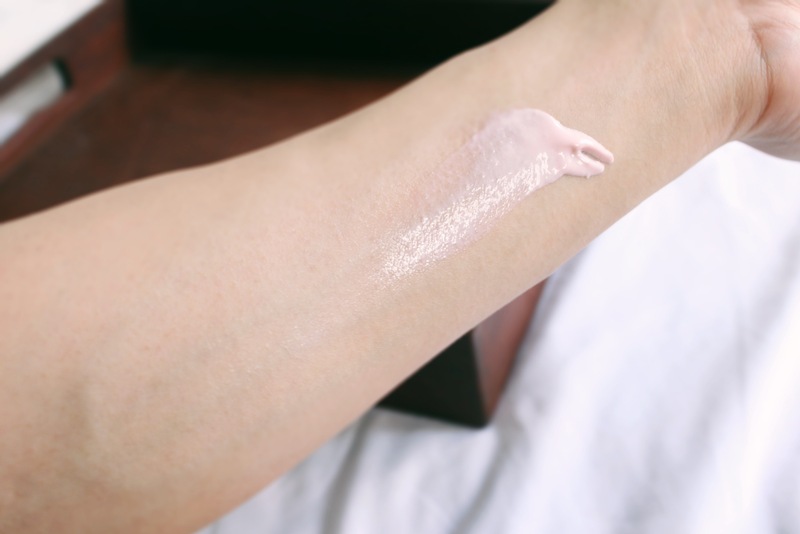 I actually noticed upon swatching that it has an instant whitening effect especially under light and just basing on the look, it’s because it is a bit shimmery and white-pigmented (cosmetic). I like Vaseline more under this category because it gives me a more pinkish/healthy glow but I would consider the other Skin White variant for the above uses: Glutathione + Vitamin C (from Lemon, orange, etc which you can notice from the scent) which has more healthy ingredients. For this purpose, I really look at the ingredients and I apply the products on targeted areas of the skin where there are visible unevenness and darkening. I like the Belo products under this category because the ingredients are truly powerful – just the like the ones my dermatologists use for brightening my face after facials and pricking! Belo Intensive Whitening Cream SPF 30 – This is the most expensive on the list even on its 220ml level, but I think that’s because of the Kojic Acid (proven to inhibit melanin production) and Tranexamic Acid (lightens stubborn dark spots that dont respond to other ingredients) combo present in the body cream. I use it on targeted areas and days after I shave as treatment. 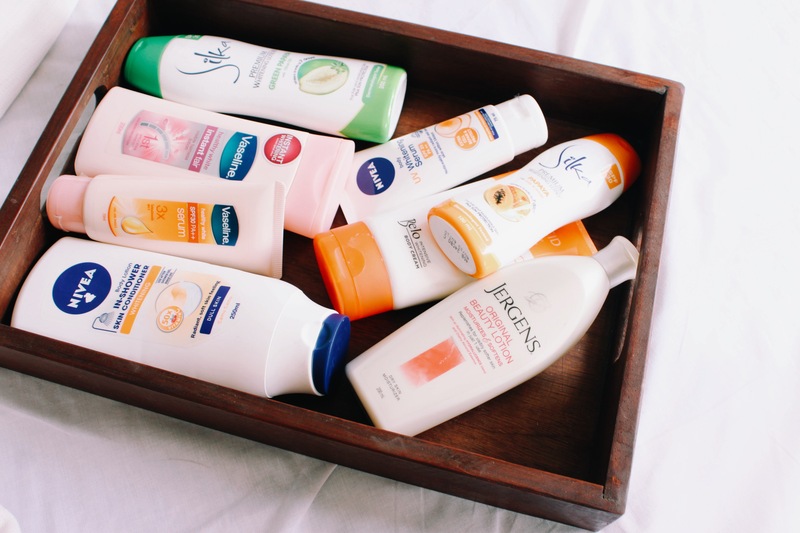 So, what lotions do you use, for what use, and what do you like about them? Hi Nina! Yes! ‘di ganon’ kabilis pero once it is dried, it’s deeply absorbed by the skin though which is very nice since maganda ang active ingredients =) And since may acids, it’s very good that it has SPF so it doesn’t get damaged. This is really a nice review. You described the lotions based on their essential features. Hope to have more of these kinds of review in the future. Anyways, I use Vaseline Healthy White Instant Fair Lotion when I go to office because it’s very light and not sticky, but when I will be exposed under the sun for too long, I use Nivea lotion with high SPF. I don’t use whitening lotion when exposed too long. try nivea,sinced nivea is trusted brand,Nivea ingredients is most powerful and they have own formulation. Alin po mas effective instantly? in terms of whitening try to use met tathione soap and lotion.The first week to use you will notice of peeling then you will see the effect of whitening. Hello my friend! I wish to point out that this post is amazing, nice written and have approximately all important infos. I might like to search more posts this way . i am using Belo Intensive whitening body cream for months and I swear ! This is really effective. Medyo mahal pero effective tlga. IJust wanted to ask lang po, kung ano ang best mong ma-erecommed when it comes to beauty soap to be partner with the Belo intensive whitening lotion ?